I won't lie, I was excited for the 1st Brooklyn Beer Experiment. Competitions are all good and nice, but center it on booze and you have me hook, line, and sinker. And thankfully I bought my ticket just in time because this was a sold out event! I apologize in advance for my blurry pictures, I headed for the bar upon walking in-those four were the complimentary beer choices. Like all competitions, there was an attempt at an orderly procession of people pass the booths lining the perimeter. On one side was main entrees followed by dessert, and the other were the homemade brews. Bez and I tried to eat the entrees, but a good number were meat-based and she's a vegetarian. I tended to focus on the desserts and the brews. 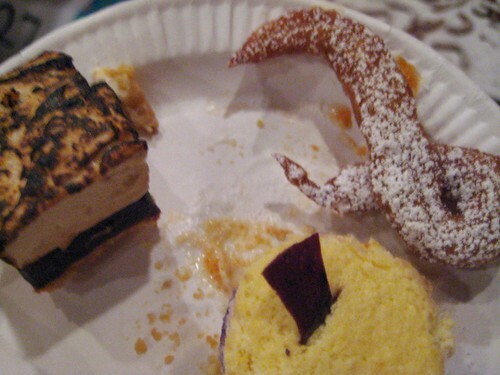 On the dessert side, there were s'mores, tarts, bread pudding, ice cream, puffs, and amazingly, no cupcakes. Nada, zilch, zero cupcakes. Are cupcakes over? Or did everyone think that someone else would bring cupcakes and they wanted to be different? I say later, even if Grub Street's hoping it's the former. Though all were very good, my personal favorite was the beer puff with strawberry rhubarb sauce-it's the season for strawberries and rhubarb, I'm feeling the love. Creativity also came out with the brews. 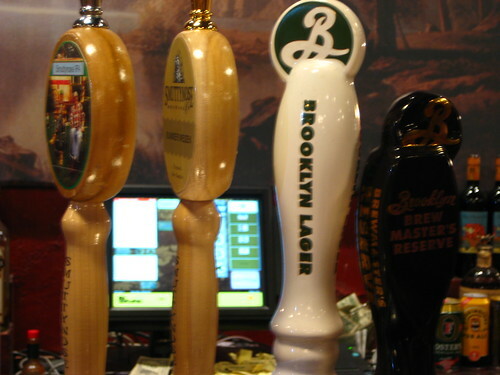 There was a good selection of brews, the dominant style being IPA. I enjoyed tasting all the different styles consecutively and picking up on their individual nuances. Again, all were great, my favorite being the Airmail. After all of that, Bez and I took pictures in the photo booth and chilled out in the front room for a while. Returning just in time to find out all the winners. By this point, I had been drinking, so some of these numbers and names might be wrong, but I think I'm good, but then again, well, you know. 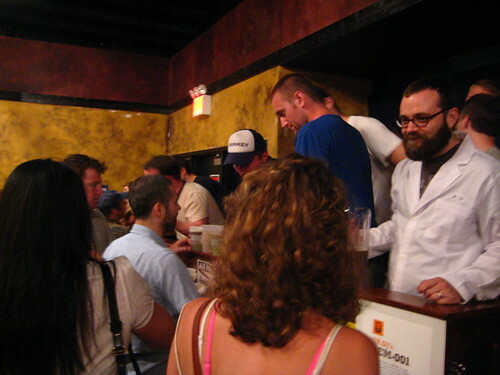 1st place: Airmail (#C) - They got a lot of beer, including some experimental, not available for the public Brooklyn Brewery beers. Nick and Theo say that this isn't all, after summer they're planning at least two separate events, one involving cheese, and the other Chinese takeout. For more of my photos however wacky they may be, click here. 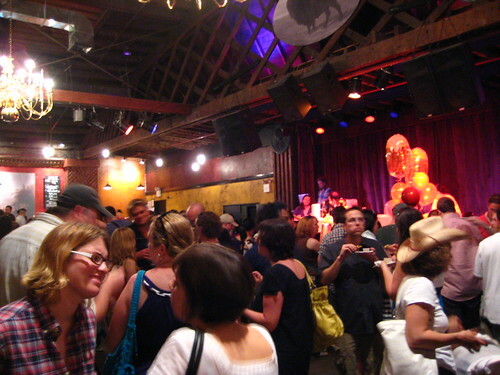 Please visit the main website of these shenanigans, thebrooklynbeerexperiment.blogspot.com and join their mailing list! You're so quick to post the recap! I was actually one of the chef-testants (hate that term), I made the blueberry ricotta tarts (in the bottom of the photo above). I think no one did cupcakes because they're a little obvious these days! 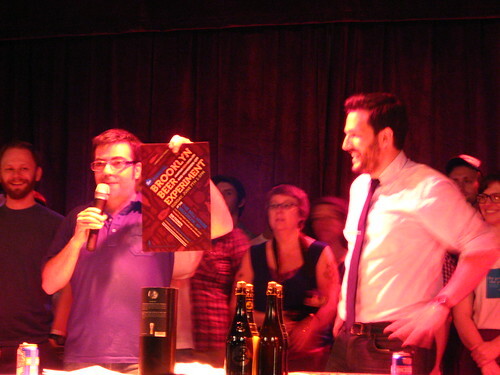 Anyhow, I have to say that I had a blast - met lots of great people (and Johnny Iuzzini!) and although I am still tired from baking ALL weekend, it was worth it. Oh man, I missed meeting one of our head commenters! Sorry. I looked back at my pictures last night, and saw your sign and your name, and hit my forehead. Yours were good too. I was amazed that no dessert had an overwhelming beer taste, it was all very subtle.